Peela pukhraj Stone as it is commonly known as, is one of the most loved and valued stone of the Navratrana set of gem stones. Not only it is a beautiful gem stone to add in your jewellery collection but according to astrology it is considered to hold the positive powers of planet Jupiter. Mainly recommended for Saggitarius and Pisces zodiacs, but it is favourable for many other people too. So, get your birth charts checked by an experienced astrologer before wearing it. For getting all the benefits of a peela pukhraj gem stone you need to ensure that you buy a real Yellow Sapphire and not a fake one. If you want to know about the ways to check if peela pukhraj is real or fake, then read ahead! Being able to differentiate between a real and fake Yellow Sapphire is really tough, however one of the easiest ways to do so is by looking it closely with a naked eye. The finish and quality of the gem stone will speak a lot for itself but just to be sure, hold the stone and inspect it closely for bubbles through a naked eye. Sapphire are known to have some inclusions in their interior, but a high quality peela pukhraj is almost free from any such inclusions. Even if there are some inclusions present, they are not visible to a naked eye in a real stone, however if it is a fake peela pukhraj it will have tiny bubbles inside it when you will look with a naked eye! 2. Avoid the peela pukhraj with X cuts! Though actual Yellow Sapphires can be cut out into almost any shape but once they exceed the one carat mark, the jewellers prefer cutting them into cushion or oval mixed cut. This is because most of the synthetic or fake gem stones are easy to cut into emerald or round shapes, which makes it difficult for people to differentiate between real and fake as both are in same shapes. However, what you can do is while seeing the stone cut, try to avoid the emerald or oval cut but if it is not possible then look for X cuts. Often, while cutting fake gem stone, manufacturers place on the facets of the gem a X cut, also referred as scissors cut. So, if you find an X cut, don’t buy that stone because probably it’s a fake one! Sapphires are considered as the next hardest gem stone after a diamond, hence it is very durable and hard to damage. Thus, it is not easy to scratch a real Peela Pukhraj as there are very few materials which can actually scratch it. 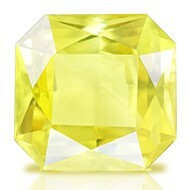 However, most of the duplicates of yellow sapphire are made using yellow glass which from a glance looks quite similar. Though when you compare and inspect closely, the real and fake are too different. Firstly, the duplicate will appear to be too colourful and huge than a real gem stone. Secondly and a more reliable method is to search for any scratches because unlike sapphire, glass is very easily scratched. So, if it is a real sapphire it will have no or very few scratches but if it is a fake one, it will have a lot of scratches on its surface! If you have doubt even after applying the above methods of physical examination, then have a look at the gem stone’s certificate. Looking a look at a certificate will give you a personal satisfaction that the stone has been checked and approved by a professional and experienced person. Hence, the chances of the gem stone being a fake one is very less! We hope that these tips will help you buy a real Peela Pukhraj stone!